If you want to know what’s going down in the world of timber construction, you could do worse than get to this year’s Timber Expo, which again brings together industry speakers as part of its Timber Focus seminar programme. Responding to past feedback, this year’s sessions have, Focus organiser TRADA claims, been honed down to seven themed sessions to interest everyone in the sector, from architect to client to contractor. The ‘Pushing boundaries’ sessions promise both real and virtual voices – with Ramboll engineer Gavin White discussing his research into building tall in timber and AA Emergent Technologies unit master Evan Greenberg extolling the use of metal-free ‘friction fit’ connections for his ‘Fingers Crossed’ birch ply sculpture for the London Design Festival (see below). Meanwhile Arup’s Tim Worsfold will talk on engineering the world’s largest gridshell structure, Foster+Partners’ Crossrail station at Canary Wharf – something speaker Ralph Parker of Price and Myers will probably have a view on, having engineered both the Savill Garden and Exeter Forum gridshells. Gridshells will also figure in the ‘Client and contractor perspective’ sessions, where Willmott Dixon senior bid co-ordinator Richard Bartlett will recount the contractor experience of working on one of the more sustainable recent office schemes – Hopkins’ WWF Living Planet centre in Surrey. And if you’ve ever dreamed of being a client for your own project, pop along to the ‘Sense of space’ sessions to hear about experiences in the Custom Build sector from Igloo’s Jon Sawyer and White Design’s Craig White. As well as specialist seminars, Toolbox Talks will concentrate on best practice in timber construction, while the industry will be showing its latest innovations in the main hall. Those keen to seal deals could get invited to the Timber Buyers and Specifiers Forum, gathering decision-makers and suppliers together for a more tailored approach to networking and generating business. 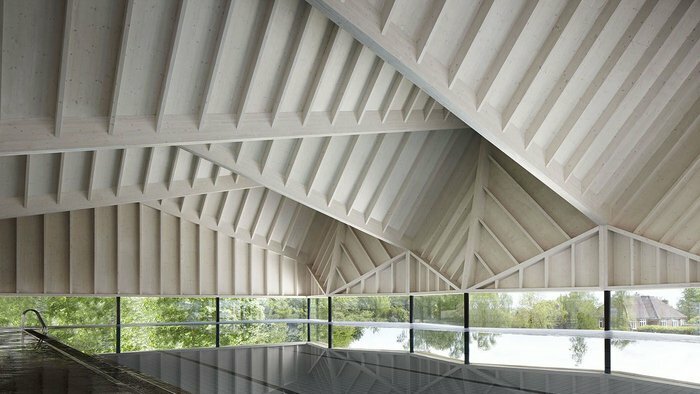 RIBA Journal will also make its presence felt when executive editor Eleanor Young chairs the ‘Architects and timber: striking designs’ sessions, highlighting some of the projects shortlisted for the 2014 Wood Awards. Here she’ll be talking to, among other shortlisters, Duggan Morris, on its charming and slightly scale-defying Alfriston School swimming pool – surely a serious contender for an award itself. We’ll have to wait until 18 November to see if it is. If you’ve had problems with gluing failure, varying dimensions, flatness or poor surface quality then SP101 is the product you need, according to Hanson’s website. It might sound a bit like a piece of Blue Peter advice on how to build a den at the bottom of the garden, but SP101 appears to boast rather better credentials, being ‘the only plywood to be Diamond certified by Technology For Timber’. So it might look like a straightforward slab of plywood flooring, but it’s actually a gem. You’d expect R&D association Trada to be highly visible at Timber Expo and it is, sponsoring the show seminars and using its stand to host its own half hour seminars and interactive quizzes (can you get a non-interactive quiz?). Hopefully a question will reveal details of the dinosaur skeleton (above) recreated in timber by the back office staff on a team building awayday to Rhyl. Seriously though, it’s an important organisation for timber – don’t miss the Wood Awards it co-sponsors later this year.